Co-Optimus - Video - BattleBlock Theater Video Features Co-Op - Or Does It? BattleBlock Theater Video Features Co-Op - Or Does It? A new video teasing BattleBlock Theater has surfaced. This one features gameplay which is not really co-op, but it's not really versus, either. Two players seem to be working toward a common goal, but they're doing it in a such a passive aggressive way. It reminds me of a bickering couple who has been married for about a decade too long. And then of course, there's all the murder. If you look closely, you may even catch a glimpse of a launch window. Don't worry, if you somehow miss it the fine folks at Behemoth spell it out for you near the end. You just can't wait to slap around your co-op partner? You can still sign up for the closed beta. That sucker kicks off tomorrow, so you better snap to it. 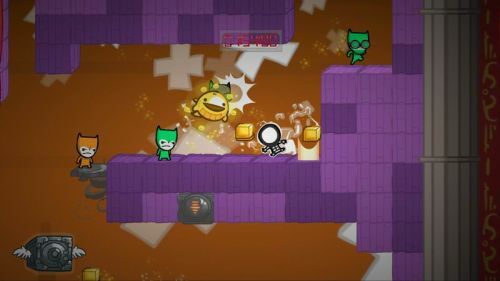 BattleBlock Theater will support two player local co-op and two player online co-op. It should be available through the XBLA this spring.